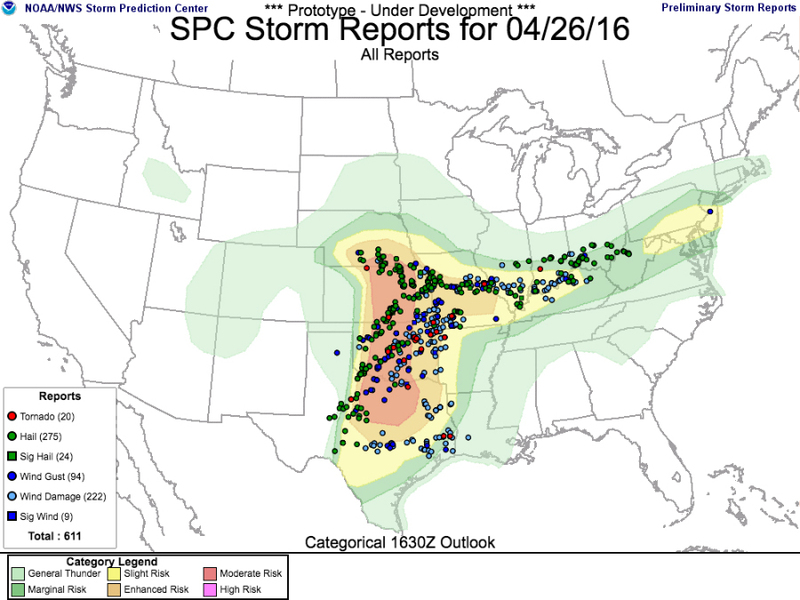 More than half of the severe weather reports for the month of April happened this week. And the majority of those occurred on Tuesday this week when the Storm Prediction Center warned everyone it would be a rough weather day. While most of the severe weather damage came from large hail and damaging winds this week, the number of tornadoes saw a certain uptick as well. In fact, the number of tornadoes for the month of April more than doubled in less than a week. As of last Saturday, April 22, the month of April had seen 38 tornadoes across the U.S. From Sunday through Thursday, 44 tornadoes were reported. The biggest day for tornadoes happened to be Wednesday, which was also the five year anniversary of the biggest tornado outbreak in U.S. history. This just goes to show the severe weather season is ramping up, and we can only expect more weather days like we saw this past week. After all, peak weather season for most of the country is in April and May when the warm moist air of spring collides with the cold, dry air of winter. There's no time like the present to download Storm Shield for your iPhone or your Android to get those severe weather warnings as soon as they're issued, giving you plenty of time to get to safety.